Another famous character of Irish pagan mythology is Balor. He appears to exist as an adversarial character, and leader of the Fomorian race who were supposed to have occupied Ireland before the Tuatha Dé Danann and the humans opposed and replaced them in the medieval pseudo-historical myths, such as those in the famous Lebor Gabála Érenn. His main attribute was a ‘piercing’ (birugderc) , ‘destructive’ (milledach) or ‘poisonous’(neimnech) eye which could, depending on the tradition do anything from making men helpless in battle to blasting, blighting and destroying. This property is often linked to the popular ‘evil eye’ mythology once so common to Europe, and still current in much of Africa and Asia. Balor was supposedly killed by his own semi-divine warrior-grandchild, Lugh, who himself was said to have been fostered by Manannán mac Lir. As such, Balor appears to have been an inspiration for Sauron in Tolkein’s ‘Lord of the Rings’, chosen perhaps because he operated as a hypostasis for an ‘evil god’ in medieval and early-modern myths. He even operated as a political representation of Ireland’s oppressors in some traditions, and his showdown with Lugh is a popular folktale. So … who or what was this character really supposed to be? The key to understanding him correctly is understanding the idea of the ‘evil eye’ as it pertains to Atlantic European mythology. The Evil Eye, Bad Eye or Destructive Eye was a phenomenon known in particular from its recorded incidence among peoples from the Scottish Highlands and Islands, the Isle of Man and Ireland between the 17th and 20th centuries. The essence of the Gaelic evil eye belief was that the eye emitted a spiritual force (spirit was anciently considered an ethereal form of light) which could alter what it looked at (touched). This idea (the ‘extromission’ of light from the eye) was known from classical antiquity, and discussed in both scientific and religious theory by medieval European authors such as Robert Grosseteste and Thomas Aquinas. Pride and envy were considered the ‘spiritual’ sins and operated through spirit and thus light, which was considered the substance from which spirit was made. The force of the Evil Eye was supposed to be driven by the ‘deadly sin’ of envy, and caused a loss of vitality and well-being in the subject of the envious gaze: it was a metaphysical interpretation of how the spiritual ‘sin’ of envy (literally translating as ‘in vision’) worked as a malign force which could change things at a distance. It could be a passive force (whereas ‘witchcraft‘ or sorcery was considered an active process), and this distinction was perhaps one of the reasons why the Gaelic peoples (preoccupied by fairies and the ‘bad eye’) did not prosecute witchcraft as a general rule. The ‘Evil Eye’ and its associated otherworld theory was the explanation for misfortune! And the ‘Evil Eye’ was a force by which those ‘spiritual’ beings – the fairies – exerted their power on this world. They envied our ‘substance’ and ‘worth’ and tried to take it from us… they abducted our healthy children and left us their unhealthy ones… they sickened and blighted: It was the mode by which the ‘Otherworld’ interacted with ours! Considering this, we must now turn our attention to the Gaelic Lord of the Otherworld – Manannán mac Lir – who ruled the world beneath the sea and behind the horizon where the sun sets. As ruler of this inverted place and we must consider if he might in fact be identifiable with the ‘Balor’ character of Irish myth – a sea-ruler who originally (in some traditions such as the Manx) held the sovereignty of the Land, and whose eye chose the lives to be transferred to the Otherworld… Balor is associated with Tory Island off Donegal, and his ‘race’ is supposed by the medieval writings to have come from the sea. 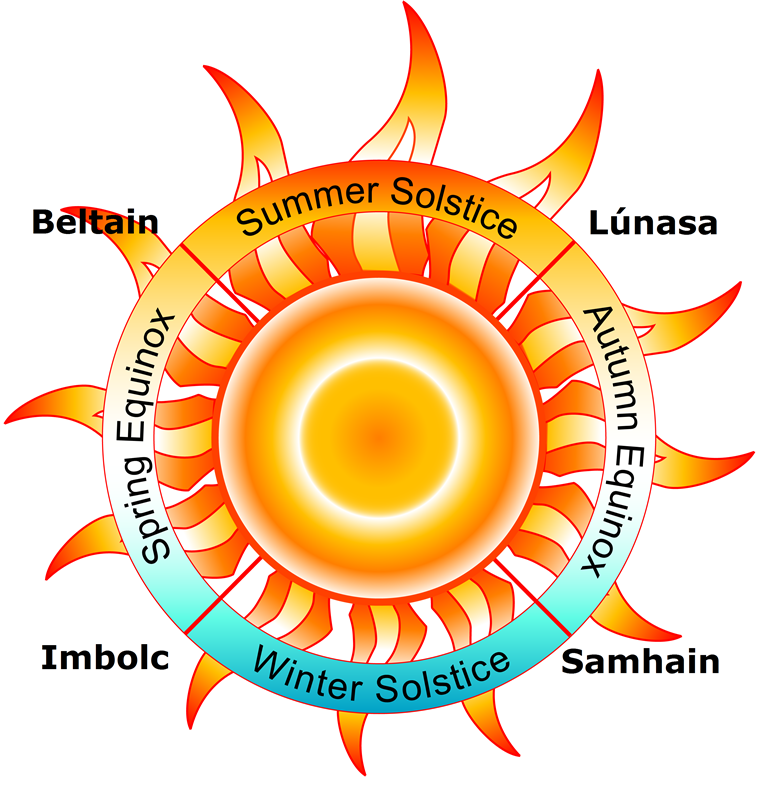 Traditions tell that he was grandfather or father of Lugh (who eventually killed him) and that Lugh was fostered by Manannán, so there is a reasonable argument in suggesting that Balor may be a part of the Manannán hypostasis. The early Welsh Arthurian tale known as Culwch and Olwen features a central character with features similar to Balor – the giant Ysbaddaden Bencawr. The description of him sounds a little like that of Balor in the Irish tale Cath Maige Tuired (Battles of Moytura) in that he is of a giant size and had eyes (or an eye) so huge that they required great forked sticks to open his eyelids. This begs the question of wether the character is a bardic metaphor or a character nested deep in popular mythology. Other similarities include the possession of a desirable daughter over whom heroes fight – with Balor it is Eithne and with Ysbaddaden it is Olwen. The concepts of decay and death have stronger ‘evil’ or ‘unclean’ connotations for christians, yet in religious cultures with a belief in reincarnation they are loaded with more positive connotations. This begs the question of why and to whom Balor’s eye was supposed to be ‘evil’? This is not explicit in the descriptions of the ‘Second Battle of Magh Tuired’, in which Balor’s eye is said to be Birugderc – piercing. The ‘evil’ appelation is one of the narrative tales of his behaviour and of christian tradition, such as that collected in the early 19thC by John O’Donovan from Donegal and Tory, and from those of the other folklore records, including those of the goverment-sponsored Folklore Commission (Coimisiún Béaloideasa Éireann) from the 1930’s onwards, now curated by University College Dublin. Mongán is a character who appears in medieval Irish myth literature in connection to both Manannán Mac Lir and the Cailleach. This relationship appears in one of the versions of the various Mongán tales found in the manuscript collection known as the ‘Book of Fermoy’ (Royal Irish Academy: MS 23 E 29): ‘Compert Mongáin ocus Serc Duibe-Lácha do Mongán’ (‘The Conception of Mongan and Dub-Lacha’s Love for Mongan’), appended to the story The Voyage of Bran both of which were translated together by Kuno Meyer. The tale starts with a visit by the Irish King Fiachna Finn to the sick king of ‘Lochlann’ (either Scotland or Scandinavia), Eolgarg Mor, who sends his men to beg the ‘Caillech Dub’ for her magical cow, the flesh of which would heal him. This she agrees to do, on the condition that Fiachna stands surety with his life and honour that Eolgarg will make good. He doesn’t and the Cailleach comes to Fiachna and demands he make war on Lochlann, and he obliges her, although his assault is initially thwarted by Eolgarg who unleashes battalions of deadly poisonous sheep (!) against the Irish, killing many of them. Manannán Mac Lir then appears to Fiachna and gives him a magical hound to defeat the Scots and their deadly sheep, sleeping with Fiachna’s wife into the bargain and conceiving him a magical son called Mongán whom he spirits off to the Otherworld to teach him wizadry and shape-shifting abilities under his fosterage until the boy matures. Meanwhile, Fiachna is killed through the treachery of one of his ambitious retainers and the peace of Ireland is disturbed, so the people of Ulster implore Manannán to restore Mongán, which he eventually does. To radically shorten the rest of the story to its bare essentials, Mongán then goes around Ireland using his magical abilities to sleep with queens and to induce kings to sleep with the Cailleach by making her appear as a young woman – at one point he even kills her, but true to form she reappears later in the narrative as ‘Cuimne of the Mill’ and seduces the King of Leinster. The tale seems to be a vehicle to demonstrate the power of the Otherworld over that of men – particularly in regard to the choice of sovereigns, which was the traditional role of the Fairy Queen or Cailleach. The two Otherworld characters of the narrative are the Cailleach and Manannán, and their natures are made clear in the telling of the story: She is both beautiful and ugly, young and old, the decider of fate, and – like the seasons – dies and is reborn. He comes from beyond and shifts his form to influence events. Mongán is his divine son, and begins to function exactly like him in the world of men, causing Manannán to drop out of the plot. He even appears to be the power that transforms the Cailleach from old hag to attractive bride! This ‘loathly lady’ motif recurs often in medieval fairy literature, for instance in Chaucer’s ‘Wife of Bath’s Tale’. 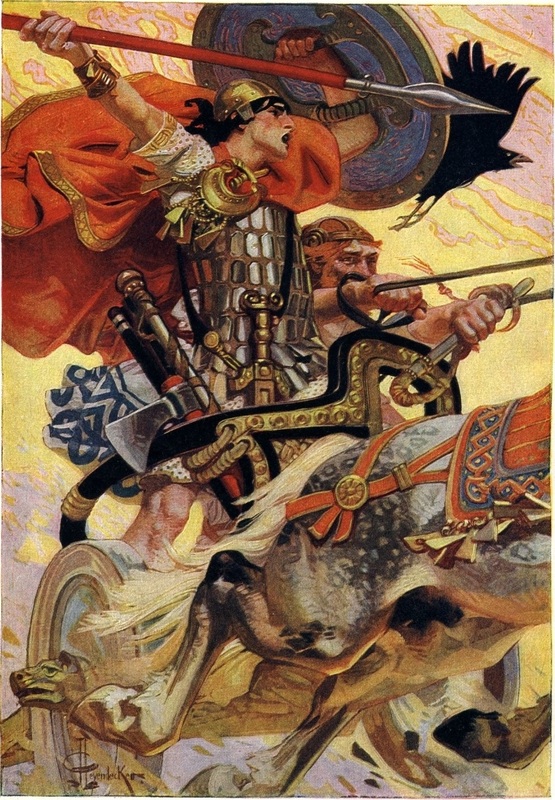 Apart from the skilled young trixter-warrior character of Lugh of the Tuatha Dé Danann, Finn Mac Cumhall and Cú Chulainn are the two primary magical warrior-adventurers of Gaelic legend: The former is a member of a youthful warrior-hunter band, the Fianna, whose tales are collectively known as the Fenian Cycle. The latter is the erratic warrior-champion of king Conchobar, and the protagonist of the ‘Ulster Cycle’ tales. Both appear to be from different story-telling traditions from literature and orature, yet they seem to share a tantalising similarity which needs to be examined. They combine an essential function that relates to the pagan mythos – one that Christians felt suitably important to record in written form, perhaps fixing a shared tradition of the pre-literate pre-Christian world into two separate strands. Of the two, Finn represents the more mundane whereas Cúchulainn, like Mongán was part-otherworld. Of greatest interest is the fact that their names contain what appears to be a phonetic link to the Goddess herself – Cumhall (‘Coowal’) and Chulainn (‘Cullin’) can both be interpreted as potential versions of the Cailleach epithet. One piece of folkloric evidence of a possible link comes from a number of traditions which portray Finn as a giant whose attributes cross over with those ascribed elsewhere to the character of the Cailleach, or ‘the Devil’ or other ‘giants’: namely in the creation of landscape features and displays of strength and agility. These appear (to varying degrees, admittedly) to be attempts at obfuscating pagan creation-myths, where different story-characters are employed to cover the tracks of paganism in local legends and story-traditions. I have already mentioned the function of Finn in particular in relation to folk tales dealing with the shaping of the landscape. These are common to all of the Gaelic language provinces, and have equivalents in the Brythonic regions and further afield. In the Isle of Man, tales were once told of belief in a half-otherworld spirit called Phynnodderee (also known by the species-name Glashtin), who like the Brownie of Scotland and his equivalents elsewhere was a powerful assister of agricultural and household endeavour and well-being. In the remaining, somewhat corrupted folktales about this island fairy-character, there is a surprising degree of story-function plasticity and confluence of the Phynnodderee with tales of Finn, the Devil and St Patrick, a giant and his wife, the Cailleach and even Manannan. Phynnodderee is a fairy prince cast out of fairyland, a domestic helper, a Wildman who lives in caves in the hills, a strongman who moves giant stones around and performs great feats for farmers, a lover of mortal women, and a fractious and easily-offended friend (you should never offer him clothes). Had the Isle of Man been more warlike in its recent history, he would almost certainly (as happened with Finn in Ireland and Scotland) have been a great warrior too – and was probably the ‘sleeping prince’ living in the ‘Devil’s Den’ alluded to in George Waldron’s 18thC Manx folktales. Reading between all of these Gaelic language etymologies we find the attributes of the Atlantic Goddess: As creatrix of floods, as herdswoman of the mountains, as haunter of headlands and hilltops, as cutter of plants (in winter) and as promoter of life (in spring and summer). Also described as giver of poetic inspiration, the ‘Fairy Woman’ or ‘Fairy Queen’ might therefore be seen as a mnemonic ‘hub’ for linguistic concepts related to the religio-philosophical ideas that underpinned the universal worldview of the ancient Atlantic peoples. Maybe a core part of the secrets of original ‘druidism’ and ‘bardism’? I will go on to examine this in due course. More modern onomastics often use the word cailleach (or its variants) in the context of post-Dissolution explanations of placenames in Ireland, Scotland and the Isle of Man, to mean ‘Nun’. This is perhaps based on the tradition of women wearing veils which was common until the early modern period. However, Gaelic placenames with supposed ‘Nun’ associations are often based upon oral traditions that lack archaeological or historic evidence to back them up. Where there is evidence of nunneries giving places ‘Cailleach’ placenames, then there is always the consideration that these monastic establishments (as was so often the case) were set to ‘guard over’ former pagan sites and provide a Christian interpretation which eventually worked its way into the local oral culture replacing paganism. With this stewardship of paganism in mind, another etymology of ‘Cailleach’ can be derived from splitting the word in two: Cail- and -leach, the second part of which can mean ‘a stone’ (leach or liagh) as in ‘standing stone’ or ‘pillar’. The word ‘Cailleach’ might therefore even refer to an idol stone, possibly one what was once given a covering to wear (as on Inniskea, and in the ‘Lament of the Sentuinne Berri‘). The often bizarre ‘early christian’ crosses of Ireland, Scotland, Wales and the Isle of Man might be a little older than supposed… have you ever wondered at how their shape relates to the ‘Celtic’ seasons and model of the renewing year? 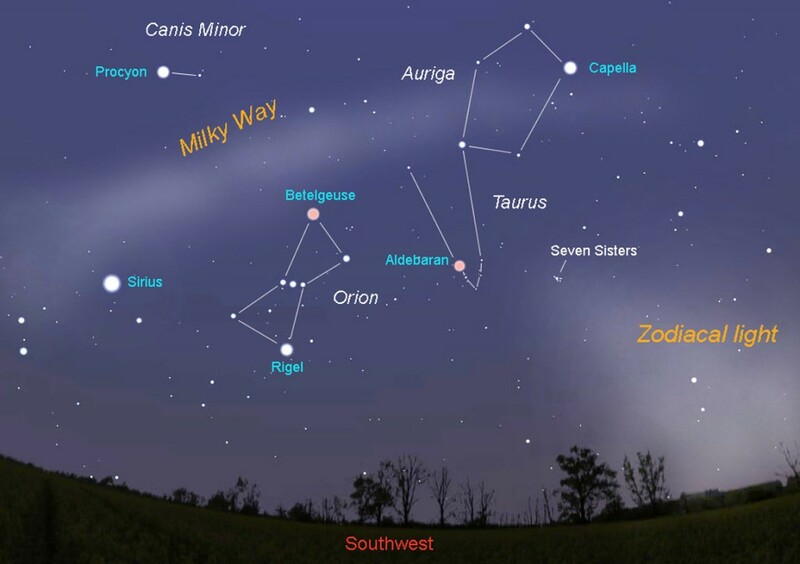 I have already mentioned in recent posts that there were legendary connections between the Atlantic Goddess and water: For starters she is represented in the constellation Orion, standing on the banks of the great white river of the Milky Way as it arches across the winter sky. As ‘Tehi Tegi‘ in the Isle of Man, she conveyed the souls of the dead across the land until they reached the rivers or the sea and were able to enter the realm of the Otherworld. The Cailleach traditions of Ireland, Scotland and Wales tell of her role in creating Lochs and other floods by neglecting to close off springs, and as the Bean Nighe she sat near water washing the garments and effects of the dead.. In Brittany she is represented by the oceanic fairy queen known as the ‘Gro’ach‘ and as a Moura Encantada in Portugal and Gallicia she is a guardian of springs. Archaeologists across Atlantic Europe recognise the association of springs with pagan goddess-worship. the two noble and exalted names. to the lough of Eochu Red-Brows. or its name is Torrand according to its meaning. The poet who wrote this account is effusive in his descriptions of the great river, comparing it (or perhaps more accurately actually identifying it) with the other great rivers of the known world, including the River Severn, the Tiber, the Tigris and Euphrates, the Jordan etc. It was believed that the oceans were made up of all the world’s rivers in the era of authorship – an idea born of classical antiquity and beyond. What is more important is the author implies that the river actually runs from Sid Nechtain to the ‘paradise of Adam’, being a direct allusion to a christianised telling of the pagan Irish belief in an Otherworld at the Ocean’s End, and to the Garden of Eden, where Christians believe life begins! This almost tells of a former belief in rebirth… The passage also implies that the river is regenerated from the East and returns to Sid Nechtain to flow again by some unspecified route. from which gushed forth every kind of mysterious evil. he would not come from it without blemish. Flesc and Lam and Luam. to the well, without being thirsty to make trial of its power. three waves burst from it, whence came the death of Boand. The ‘club’ of the Cailleach was an interesting metaphorical tool that seems to have informed many Atlantic pagan seasonal traditions… In summer (from Beltain to Lúnasa – the season of the constellations Virgo and Taurus) it represented either a ‘sprouting branch’ (traditionally held by the character depicted in Virgo), the drover’s ‘cow-switch’ or the shepherd’s ‘crook’. The ancient Irish word for a cowherd – búachaill – is very similar to that in other Celtic and Indo-European languages (eg – Greek = βουκόλος = boukolos). It is also used adjectivally (as buachalan) to mean ‘cow-switch’ or in modern times, as a class-word for any useful tool. It also became a class-word for stalky plant species: Buachalan Bui is the Ragwort (Senecio Jacobea) and Buachalan Ban (Manx: Bollan Bane) was used for Mugwort (Artemisia Vulgaris): Both make excellent cattle-switches as it happens, and it is desirable to pull up the former from pastures as it harms cattle. The Manx Bollan Bane is the traditional herb associated with the Julian Calendar midsummer celebration of Tynwald Day in the Isle of Man: Old English herbals refer to it as ‘Motherwort’ and it was used as a protective charm against miscarriage (nature’s womb is ripening at midsummer when the Artemisia flowers). Stalky plants (cuiseόg – ‘fairy dogs’?) of this type are notable as they leave their ‘bones’ or ‘ghosts’ standing dry in the winter landscape, whereas more tender vegetation tends to compost. The Artemisia, the Senecio and other plants of the Gaelic cuiseόg class (including the umbilliferae including Hemlock, Cow Parsley etc) were given superstitious associations with fairies and ‘witches’ in folklore. 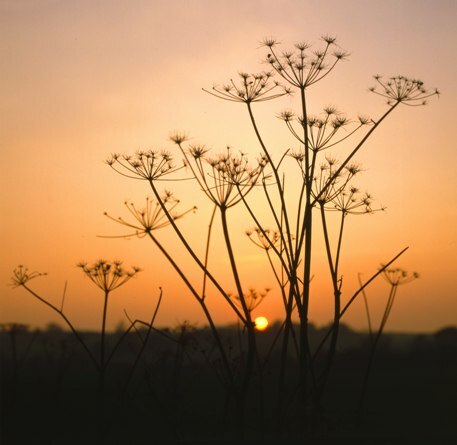 ‘Vervain and Dill hinder witches of their will’ (English tradition quoted by early folklorist John Aubrey, 1721) – the stalky plants whose shapes survive in the winter landscape (in spite of a ‘beating’ by the ‘goddess’) often had a superstitious reputation in folklore. In harvest the ‘club’ might represent the reaping sickle or threshing flail. In fact, harvest is the start of autumn and plants are usually spent of their generative power when they have fruited. They give life and seem to die back – so it is perhaps no surprise that the Cailleach theology gave her a ‘club’ by which she might beat vegetation back and give new life simultaneously. 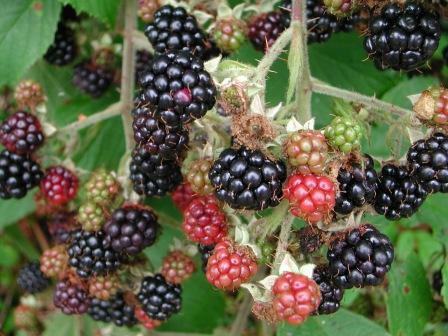 Children in the Isle of Man (and elsewhere) used to be told not to pick and eat blackberries after 10th October (Old Michaelmas by the Julian calendar) as the ‘Devil’ was supposed to have touched them with his ‘club’ and turned them sour. 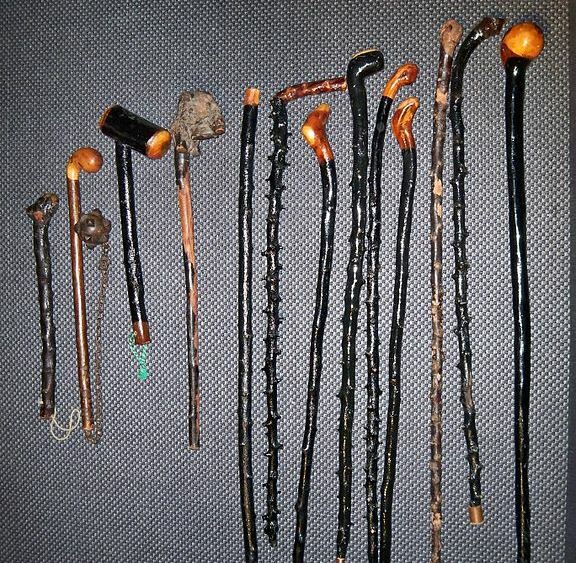 Shillelaghs – cut from the hardwood of Blackthorn or Oak, they make formidable weapons … or Hurling sticks! 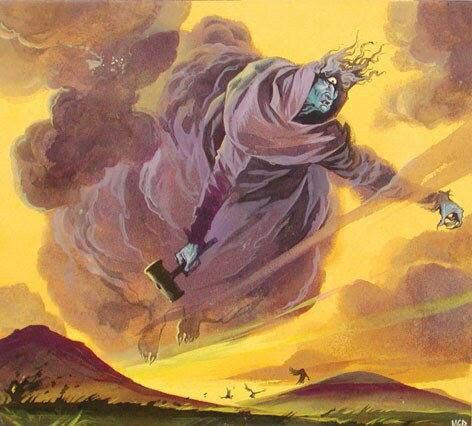 A modern depiction of the Cailleach Bheur (‘Hag of Winter’) of Scottish Highland legend. She carried a hammer or staff to beat the vegetation back into the ground in the cold months.